Thinking back to that first weekend in July the summer was still a flurry of possibilities. Autumn was barely a spot on the summer’s horizon. It was a warm day and the field was alive with drumming, dancing, rapping and the faint smell of spray paint. It was another Free First Saturday at the Walker. DJ Mal (aka Jamal Denman) had guest curated the event seamlessly presenting Genesis: A Journey through the Evolution of Hip Hop featuring D Ray, DJ Nex, MC Sol, and Kenna-Camara Cottman and company (Voice of Drum and Dance). The hip hop community had infiltrated the contemporary arts community and the result was electric. 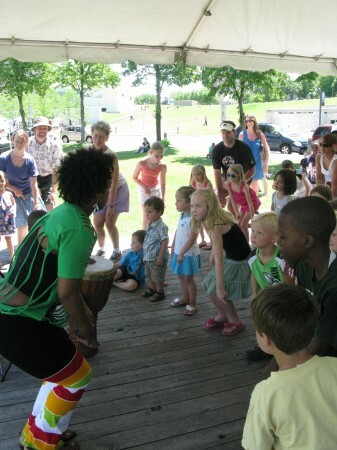 Drumming, mixing and dancing workshops illuminated the Belvedere stage and beatboxing echoed through Sky Pesher. Children and their parents camped out at the picnic tables making street art while local graffiti artists worked on a collective mural on the field. The event culminated in a performance illustrating the evolution of hip hop through dance from its African origins to its contemporary influences. As we watched the dancers in awe I reflected on the importance of this event. An intersection of Minneapolis subcultures sharing the same experience and perhaps building a small community, even just for one sunny day in July.